Make your laundry cleaning experience convenient with the efficient LG T7281NDDL 6.2 kg Fully Automatic Washing Machine. You can easily remove germs and tough stains from clothes by using its user-friendly features. This washing machine sports a top loading design to load and unload clothes conveniently. 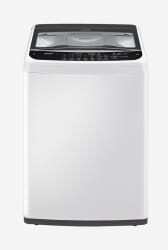 Thanks to its high-quality construction, this 6.2 kg washing machine offers improved durability. Moreover, its Smart Inverter is an energy saving technology that eliminates wasted operation by efficiently controlling energy use.